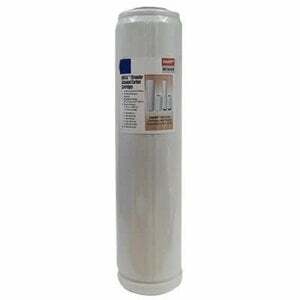 The Watts IF-SM-KDF020B 10 Micron 20" KDF / GAC Filter Replacement Cartridge is a 20 inch GAC and KDF filter replacement for use in many water filtration systems, especially whole house filter systems. The Watts IF-SM-KDF020B is a large diameter filter (4 1/2" diameter) that can be used in all 20" x 4.5" Full Flow water filter housings. It lasts up to 5 times longer than standard carbon block filters. 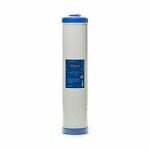 This advanced Watts Intelifil water filter replacement cartridge primarily reduces the bad taste and odor of chlorine and other chemicals in water. It is a multi-purpose water filter cartridge that uses a combination of bacteriostatic KDF-55 filter media plus coconut shell granular activated carbon (GAC) to reduce heavy metals such as aluminum, arsenic, mercury, cadmium, copper, iron, lead, and other water soluble heavy metals as well as particulates like sediment, dirt, rust, sand, silt, limescale, bacteria, algae, VOCs, THMs, and more down the 10 micron level. 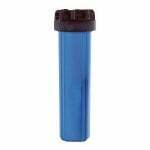 This is a replacement filter for the Springhouse US70238 and IF-SM-KDF020B. This system was previously manufactured by Ecoquest. 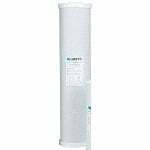 This is a compatible replacement filter for the discontinued Watts KDF55 / GAC 20" Filter Cartridge (GAC-BB20K/1800). The Watts IF-SM-KDF020B is also known by part number US70238.